Sweet corn is definitely one of the top vegetables of summer. Corn loses its natural sweetness with every minute after it's been picked, so freshness is key for the best corn-on-the-cob (or corn off the cob!) experience. 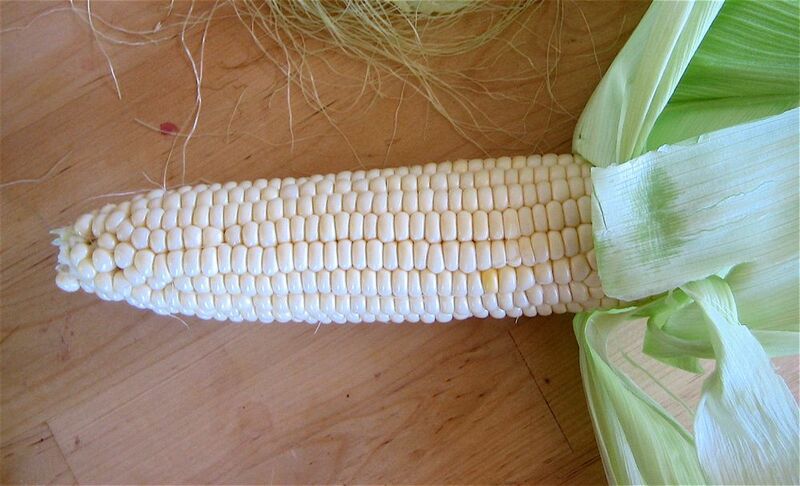 Look for fresh, bright, moist cut ends and plump, full kernels with you buy sweet corn. Once you get corn home, you can store it loosely wrapped in plastic in the fridge until you're ready to cook it – but be warned: the sooner you use it, the sweeter it will be. Boiled or steamed corn on the cob might be the most popular way to cook sweet corn, but throwing it on the grill is an excellent option, too. Getting the kernels off the cob is easy enough, and opens you up to all kinds of delicious salad, soup, and baked goods. Cool as a cucumber is no exaggeration. Cucumbers can be up to 20 degrees cooler inside than the ambient air. Cucumbers are available at grocery stores all the year round, but are at their best during their natural season of summer and early fall. You can learn more in All About Cucumbers, and see the difference between different varieties in this Guide to Types of Cucumbers. Then get cooking, whether Corn, Cucumber, Tomato Salad is your thing, or you tend more towards a chilled Cucumber Martini. As with almost all fruits and vegetables, look for eggplants that feel heavy for their size. You want smooth, tight, shiny skin – avoid any eggplants with soft spots or wrinkled bits. The sometimes bitter undertone of eggplant is easy to whisk away with a quick soak in salt water (fancy people call it "brining"). Once brined (or not), try Grilled Eggplant or Crispy Eggplant Sticks. Sweet peas, garden peas, pod peas, English peas – it doesn't matter what you call them. The fresh, plump, sweet peas that you pop out of their pods are easy to eat pound after pound right from the pod before it ever occurs to anyone to cook them are one of the great eating pleasures of local eating. When you are done eating them raw, barely warming them with steam and serving them with melted butter is a nice way to go, or cook fresh peas with rice for a light summer dish. Green beans, pole beans, haricot verts, wax beans, Romano beans. Whatever bean you're buying, be sure to look for firm, smooth specimens. These fresh summer beans are most commonly steamed, buttered, and served. If that's your bag try this Easy Way to Steam Green Beans. Feeling more adventurous? Here are a few ideas: Braised Green Beans, Buttermilk Fried Green Beans, Roasted Green Beans, and Green Beans With Chile Mint Dressing are all great places to branch out with your green bean cookery. Okra has gotten a bad rap from many corners. "Slimy" is how some people describe it. But when these lovely little grassy pods are dry-cooked (sauteed or fried) or combined with something acidic, like tomatoes, that effect it mitigated and their seedy yet soft texture shines through. Look for bright, firm okra pods – the less browning the better (some is all but unavoidable unless you grow it yourself). Bring it home and try it fried, as a spicy saute, pickled, or cooked with tomatoes. There are many, many types of sweet peppers, and most are delicious roasted or grilled. They can also be used in pastas and salads. Even the less popular (but more common) green bell pepper can shine when treated with a bit of respect. Slice it thinly and dress with vinegar, olive oil, and salt to make a simple slaw. Shelling beans (a.k.a. soup beans), as opposed to pole beans like green beans and wax beans, can be dried and stored for later use. Fresh shelling beans are one of the great treats of local eating. Shell them and cook them in soups or simply braised as a side dish - they have an extra creamy texture and wonderful clean but earthy flavor. Try these Braised Shelling Beans or toss these filling legumes into the soup of your choice. Tomatoes are the poster vegetable - the cause célèbre, if you will - of seasonal and local eating. Finding tomatoes that taste like tomatoes may be the biggest single draw to farmers markets around the country. Look for dry-farmed, vine-ripened, locally grown tomatoes. Sometimes the best available tomatoes are heirloom varieties, but many hybrid varieties have a lot to recommend them. Buy by taste, not provenance. Truly ripe tomatoes are best left simple, salted or put in a Caprese Salad (or, for a bit of a twist, this Caprese Pasta!). These 10 Quick Tomato Recipes will also help use up a bounty whether you've grown or bought them. Still overrun? Try freezing tomatoes, making tomato paste, or canning tomatoes to extend the harvest. Famously prolific, zucchini and other summer squash overwhelm many home gardeners and farmers markets. Look for smaller squash for a more tender texture, and choose zucchini with firm, unblemished skin. Once home, try Zucchini Butter, Zucchini Fritters, Zucchini Frittata, or even Zucchini Pickles.